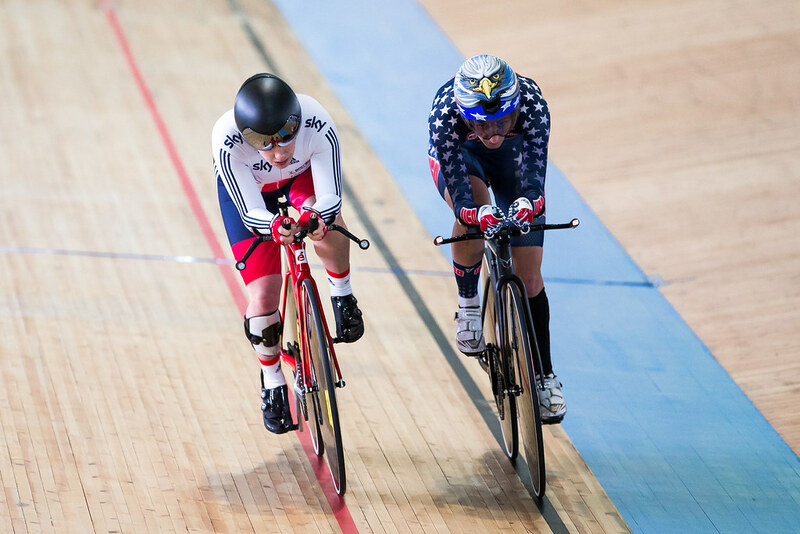 It was a golden opening day for the Great Britain Cycling Team at the 2016 Para-cycling Track World Championships as Megan Giglia, Kadeena Cox and Jody Cundy all claimed gold medals. For Giglia and Cox it was the first rainbow jerseys of their fledgling cycling careers. Giglia looked hot favourite all day after storming to a new world record in the women’s C3 individual pursuit qualifying in the morning session. That set up a final with German rider Denise Schindler, and although Giglia couldn’t quite match her world record pace of the morning session she still dominated the final, winning by a margin of over six seconds. “It’s a bit surreal but it’s started to sink in. The thing is because it’s the first event I’ve still got a couple more events to go I’m trying not to get to get on top of myself and stay focussed on each event as they come up first. Then afterwards I’ll probably have a lot of time to think about it – what I’ve done well, what I need to work on to make myself even faster for next time. Kadeena Cox produced a stunning performance to win the women’s C4 500m time-trial. Overcoming her disappointment at being reclassified yesterday afternoon Cox was the first rider to set a time and did so in some fashion, breaking the world record with a time of 37.456 which nobody else in the field was able to match, allowing Cox to complete the unique achievement of becoming a world champion in two different sports. Jody Cundy proved once again that he is the best in the business in the men’s kilo adding yet another world title to his incredible collection. Going out second last, Cundy knew he had to post a good time with the talented Jozep Metelka set to follow him. Cundy’s time of 1:04.654 was too good though and he was delighted to come away with another rainbow jersey. “The time I did today is my sea level best, which, considering three weeks ago I wasn’t even doing standing starts, is really impressive. There were also a further three medals for the team. Sarah Storey and Crystal Lane claimed silver and bronze respectively in the women’s C5 500m time-trial while Jon Allan Butterworth, who also rides in Sunday’s team sprint returned to world championship level with a silver medal in the men’s C5 kilo. The Great Britain Cycling Team will be back in action on the second day of competition tomorrow with Megan Giglia looking for her second world title as she goes in the C3 500m time-trial.